AVSF (Associazione Volontari Senza Frontiere "“Volunteers Without Borders-) is a Italian non-profit organization, established with the purpose of helping most marginalized and needed groups, especially children and women. Since 10 years AVSF is working in the remote Far Western region of Nepal, in the small town of Tikapur, in collaboration with the partner organization Volunteers Without Frontiers (VWF), to empower landless and Dalit communities, through support in shelter, education and health. We are currently asking to people to contribute to our project, to enable 280 children from poor socio-economic backgrounds access to education. As a consequence of the ten-year civil war, both the economic and social conditions of large sector of population has worsened. This had an extremely negative impact on children and adolescents. Their education and well-being should be the priority in the post conflict era, to enable the future generation to build a peaceful and sustainable society. 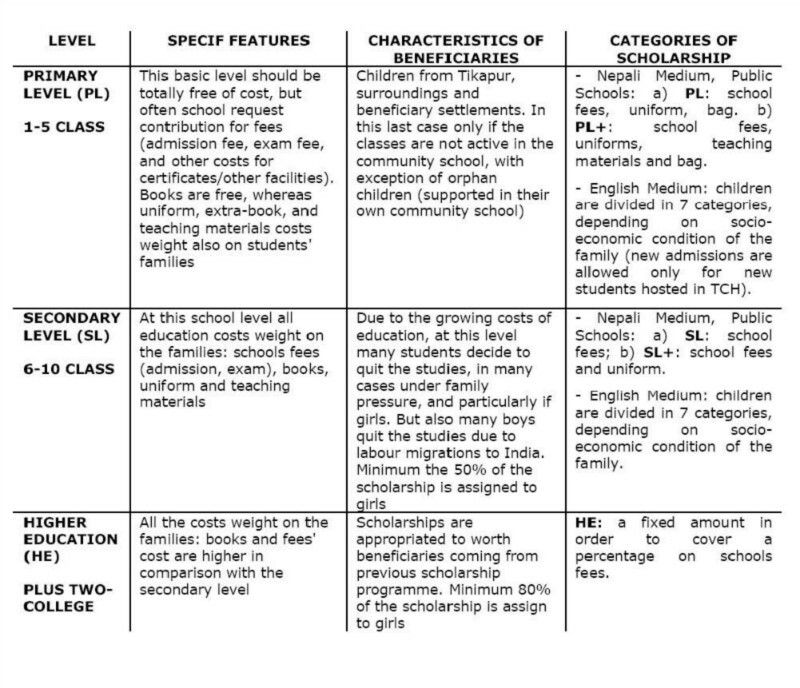 In Nepal, education represents both a direct and an indirect cost for the family: on one hand the direct costs of fees, uniform, books and teaching materials, and on the other hand the cost-opportunity of a worker less in the family. Since school fees and teaching materials gradually become more and more expensive at every class upgrade, the misery economic conditions usually prevent the families from giving a further scholar education to their children. Every year, many students drop out. The reasons can be different, but in general referable to a specific cause: poverty. Many young boys, between two scholar years migrate to India for seasonal works, and in many cases, they do not come back or they decide to do not continue their studies. Girls are frequently promise in marriage very young, and even in the household are usually engaged in hard house work. The opportunity of attending school and keeping on their studies is not given to them, as it is given to their brothers. As consequence of death or remarriage of the parents, many children are abandoned. Among 280 beneficiaries, 26 are living in the Tikapur Children Home, the hostel that provides shelter, food, health services and education to children at risk of social exclusion. More then 60% of scholarship are given to girls. The support of the scholarship changes depending on the level, family economic condition of the beneficiaries: we pay for their tuition fees and we provide them with uniforms, books, teaching materials and bags. The complete support scheme is provided in detailed below. Please write to nepal@volontarisenzafrontiere.org and ask for our flysheet! You can promote our initiatives in your office, school, shop, etc. Tikapur Children Home needs your help! Support AVSF in granting education to more than 200 children. We count on you! Vi ricordiamo che la raccolta fondi on line sarà aperta fino al 31 agosto 2013. DONATE NOW!